The R-PLEX Human RAGE (soluble) Antibody Set includes a matched capture and detection antibody pair and calibrator for the quick and easy measurement of RAGE (soluble) in biological samples. R-PLEX products leverage MSD’s electrochemiluminescence technology for better sensitivity and a larger dynamic range than traditional ELISAs. R-PLEX matched antibody sets enable the development of singleplex and multiplex immunoassays. Individual assays may be developed using MSD avidin- or streptavidin-coated plates. Custom multiplex assays with any combination of R-PLEX analytes, as well as R-PLEX plus U-PLEX analytes, can be developed on U-PLEX MULTI-SPOT plates. To learn more about the advantages of R-PLEX products click here. 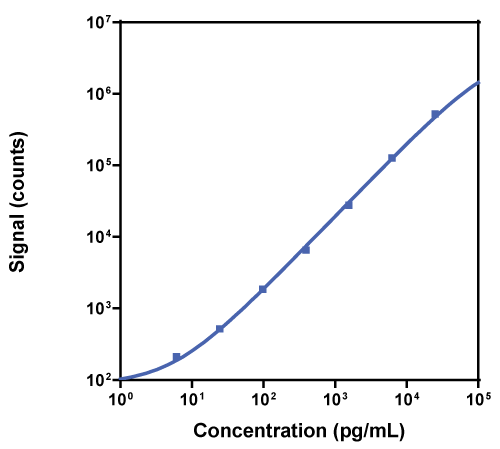 Calibration curve for the R-PLEX Human RAGE (soluble) Antibody Set was assessed and representative data are presented below. Description - Soluble Receptor of Advanced Glycation End-products (RAGE [soluble], AGER, sRAGE, SCARJ1) is a member of the immunoglobulin superfamily of cell surface molecules. RAGE is a receptor for serum amyloid A, amyloid-beta protein, and members of the S100/calgranulin superfamily. RAGE mediates interactions of nonenzymatic glycosylated proteins that accumulate in vascular tissue. The soluble version results from secretion and from enzymatic cleavage of the extracellular domain of RAGE.